The Glen-Mor Restaurant didn’t serve Bread & Butter Pickles, but it is a part of Jim’s childhood in Maine – his grandmother often made pickles. 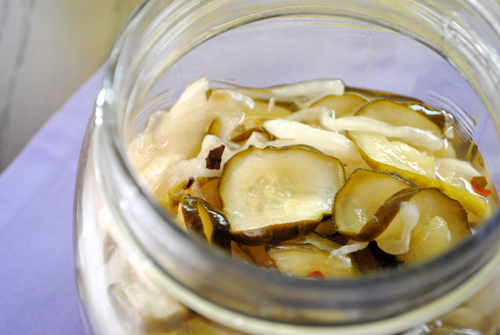 This version does not can the pickles for storing in the pantry, and instead makes pickles that can be refrigerated for up to 3 weeks. If you prefer canning and long-term storage, use the same ingredients but boil the pickles inside jars, as would be done in any canning preparation. Slice cucumbers into thin rounds, approximately 1/8-inch thin. Place in a large colander placed over a large mixing bowl. Thinly slice the onion and add to the cucumbers. Add salt and toss to coat. Cover with a thin dish cloth and several layers of ice. Set aside on the counter for 2 hours. In a medium stock pot, combine vinegar, sugar, and pickling spice. Bring to a boil and stir to dissolve sugar. Discard liquid collected in the mixing bowl and add cucumbers and onions to the pickling liquid. Reduce heat and press vegetables down to submerge in the liquid. Cook over low heat for 5 to 8 minutes or until the cucumber skins brown. Use a slotted spoon to transfer cucumbers and onions in small batches to a large glass jar, shaking the spoon to knock off pickling spice before placing in the jar. Pour pickling liquid through a strainer and into the glass jar and discard strained pickling spice. Chill for 2 hours before serving. Serve cucumbers and onions without pickling liquid. Store in the refrigerator for up to 3 weeks.